It was a semester of firsts for NIU student Jordan Brown–his first time on a plane, his first trip to Washington, D.C., and his first real experience networking with congressional leaders to learn about science policy. Renique Kersh, associate vice provost for Engaged Learning, chose Brown to represent NIU at the American Association for the Advancement of Science Catalyzing Advocacy in Science and Engineering, or CASE, workshop. Only one student is chosen each year to attend. Brown, an Energy and Environmental Engineering Technology major expected to graduate in May of 2019, spent several days this past March in Washington, D.C., networking with fellow science, mathematics and engineering students, while learning about STEM policy and advocacy. Students studying STEM-related topics typically aren’t used to thinking about the legislative policy behind the science, she said. Hosted by a coalition of scientific and engineering societies and university and academic organizations for undergraduate and graduate students, CASE is designed to empower students with ways to become a voice for basic research throughout their careers. The workshop gives those involved the chance to not only learn the ins and outs of how STEM projects are funded by Congress but also to explore career paths they might not have thought about otherwise, Kersh said. Brown said the experience was phenomenal. 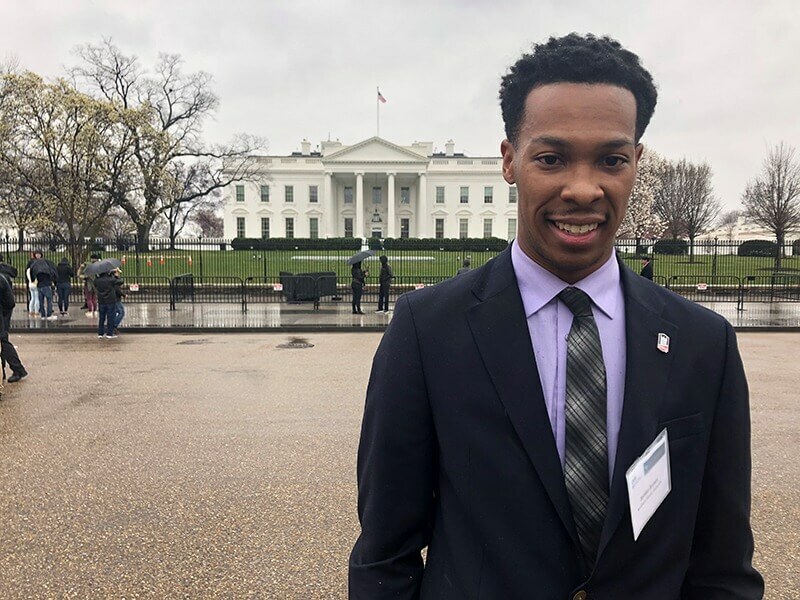 “Throughout the conference, I was able to network and form strong connections with numerous fellow STEM students and I was granted the chance to briefly experience life in Washington, D.C.,” he said. Unlike other programs in which students are sent to conferences to present on well-versed topics, CASE students go to learn, Kersh said. Kersh has partnered with Anna Quider, NIU’s director of Federal Relations, the past several years to send a student a year to the workshop, which began four years ago. “When I saw the opportunity to bring a student to D.C. and give them a premiere brief education in policy, I thought, ‘This is wonderful,'” Quider said. The information helps them understand the motivation behind what drives policymakers–knowledge that can be used both as a student and as a citizen, she said. “Something that I think is remarkable is that we are sending our students to the same exact program MIT [Massachusetts Institute of Technology] is sending their students to and Stanford [University] is sending their students to,” she said. Quider ensures it’s an engaging experience for students. In Brown’s case, she met him at the airport, brought him to his hotel where he shared a room with a fellow STEM student from another university and showed him how to use the Metro system. The students take it from there, learning from one another, as well as Congressional staff.